A couple of weeks ago, we had reported that Akshay Kumar and Taapsee Pannu were busy shooting for Naam Shabana wherein the former will be seen in a cameo. The film, which is a sort of prequel to Baby, will have Taapsee performing some high octane stunts. In a bid to make it perfect, director Neeraj Pandey has roped in French stunt director Cyril Raffaeli. Considering that Taapsee plays the role of an undercover agent, the actress has to train extensively for the film and is supposed to be quipped to do her stunts with great precision. For Baby, Taapsee learned MMA and few other techniques even though it was a special appearance which earned her rave reviews. Now with Naam Shabana being fully based on Taapsee’s character, she has had to learn martial arts like MMA and a bit of aikido apart from Krav Maga. 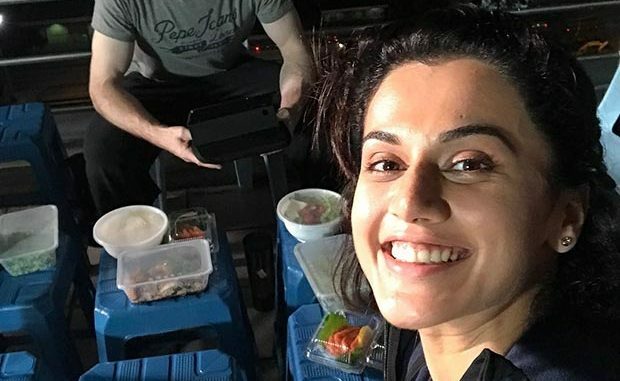 For this Taapsee took over two months of training and joining her on the sets was Cyril Raffaeli who is a famous Hollywood stuntman and stunts director. He is responsible for creating some splendid action sequences for Taapsee which the audience will get to witness in the movie. Cyril is known for his work in blockbuster movies including The Incredible Hulk, Brotherhood of the Wolf, The Transformers and many more.